Down at Now-or-Never, Mahaicony, Nadira Puran has lived her childhood dream of creating a little fairytale house nestled amid a beautiful flower garden. The middle-aged woman who lives in the nearby village of De Kinderen said she wanted her fantasy to come alive so she could admire it and at the same time, beautify her country. It turns out that she is not the only one who admires her showpiece, but lots of passersby as well. Many people would stop and be in awe at the serenity of the tiny cottage with its magical garden and other attractions. They would also take photographs and share on social media. Some admirers have told her that the ambiance that she has created helps to make their long journey less burdensome. The encouraging words have motivated Puran, who loves nature, to keep maintaining it and adding to its beauty. So attractive the house has become that people approached her for permission to have photo shoots for weddings, parties and other events and she willingly agreed. They would make a monetary contribution towards the maintenance of the place. 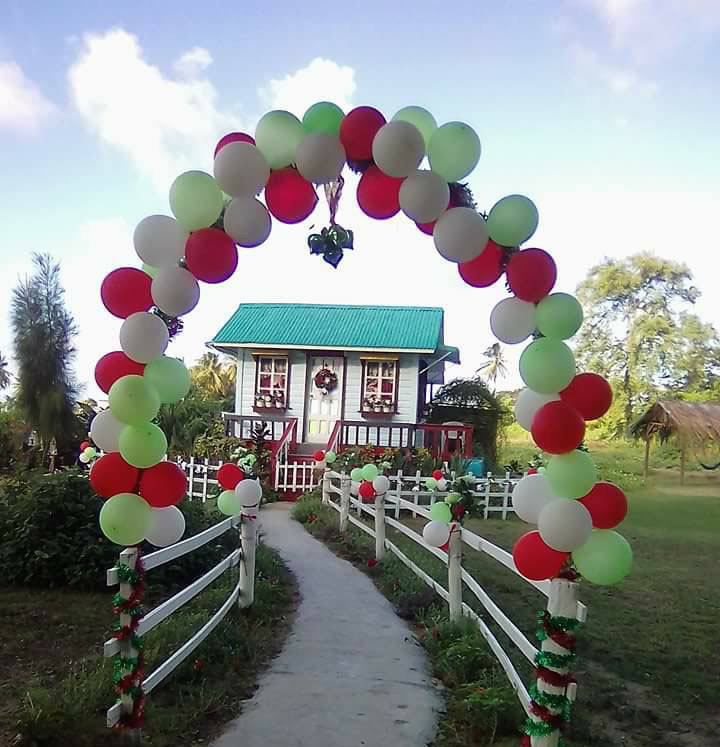 Patrons would come ahead of the shoot and enhance the flower garden further with balloons and other decorations. 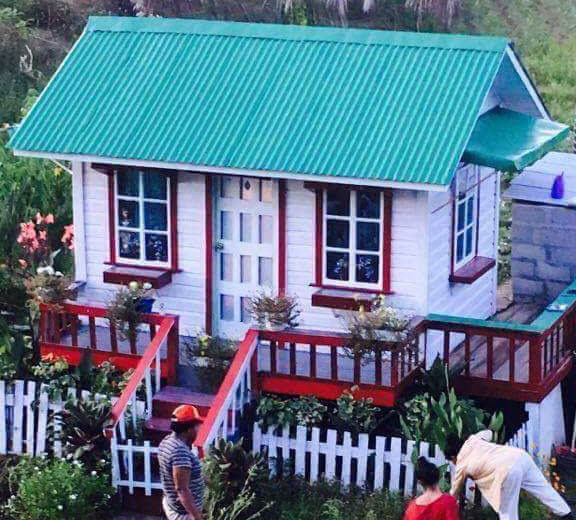 Photos of the tiny two-year-old cottage have also ended up in the press but this is the first time that Puran is sharing the story behind it all. 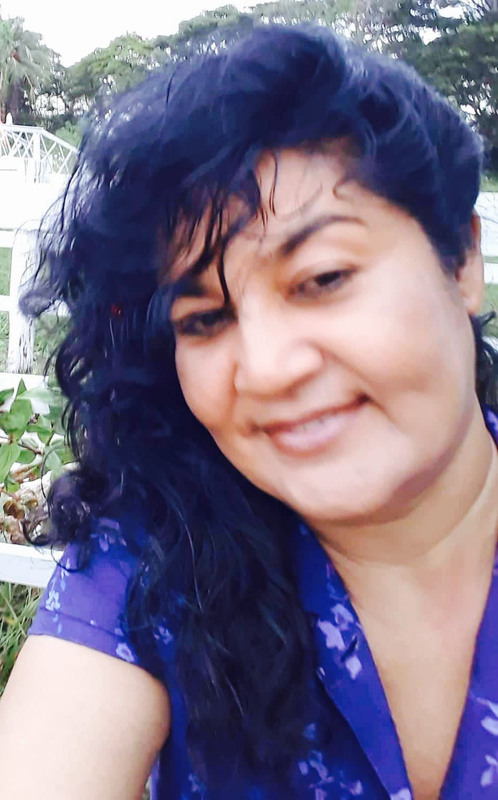 She told Stabroek News that fulfilling her dreams of making a beautiful little house among a sea of flowers, started from storybooks she read as a child. She added: “I love nature; I don’t like material things and I’m not for money. Since I was small I wanted to own a little house like this.” She is still trying to figure out a name to call it. Apart from going every day to admire her masterpiece, which she was proud to say she designed herself, she tidies it and takes care of her flower plants. She also has a kitchen garden at the back as well as a pond where she does fishing. She recently gifted the attractive cottage to her son, Christopher whose house is located behind it and promised to “see to it that he continues” what she started. 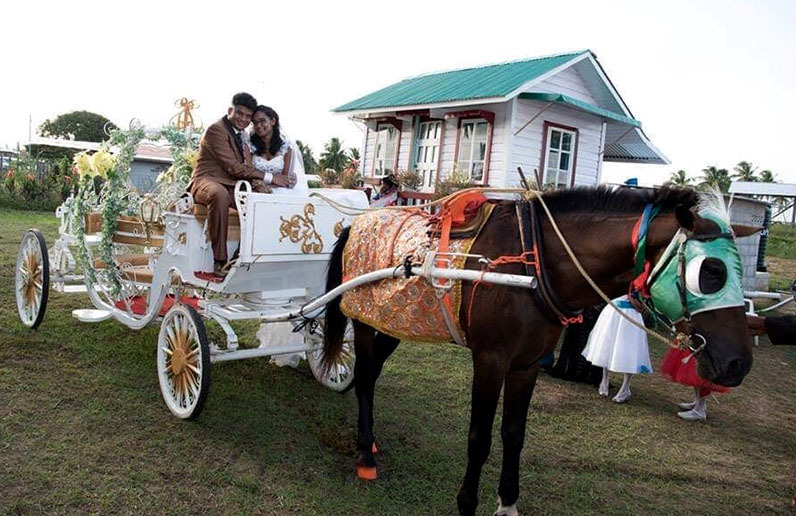 In fact, Christopher’s fairytale wedding, complete with horse and carriage, was held at the same venue about a year ago. The small wooden house is painted in white and trimmed with red and has a green roof. It is complete with a porch and front stairways and decked with fresh plants and ornaments. Among the flower plants in the yard she has fitted a water fountain, a tree house, concrete walkways, a kissing bridge and a terrace. Although her home is equipped with modern conveniences she would still choose to cook outdoors on her fireside. She would also tie hammocks under the trees and relax while enjoying nature at its best. Part of her enjoyment, sometimes with friends and family include picking fresh fruits, drinking coconut water, fishing with hooks and doing ‘bush cooks’ – the life that most busy people dream of. She encouraged other people who have unoccupied land to do the same as well, instead of allowing it to become eyesore. 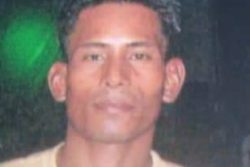 Puran said Guyanese should not wait to travel to other countries to enjoy beauty but they can contribute to the attractiveness right here. She stressed that while she’s making an effort at beautifying the place, some people who stop to admire and take photos would dump garbage around. She would keep cleaning it up but she hopes that one day they too would dream and live it like she did at Now-or-Never.